That is me, Jessica, and my two miniature Dachshunds, Chester and Gretel, from YouDidWhatWithYourWeiner.com. 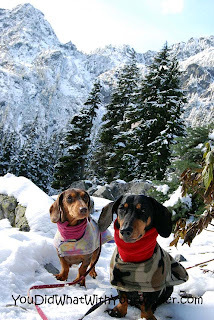 I live in the outdoor Mecca of Seattle with my fiancé and two Dachshunds. 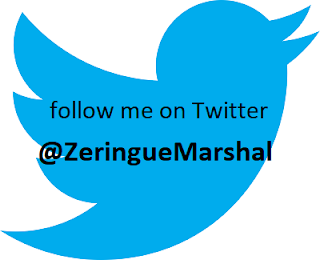 We are avid hikers, travelers and outdoor enthusiasts. I work in an office but I like to pretend that managing our blog is my only job. Maybe one day it will be. Chester is a 9 year old male. 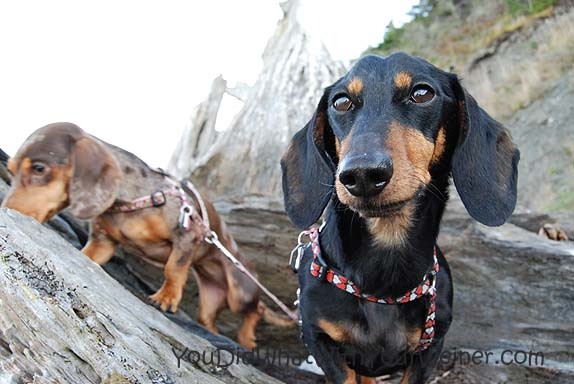 He is the black and tan tweenie. Gretel is 2 years old girl. She is the mini Chocolate Dapple. We tired ourselves out hiking the day before so we decided to take it easy today. I wanted to check out the dog lounge at Bark Espreesso, and my fiancé can’t function without his morning coffee, so we decided to stop before we headed out for a little urban hiking. It is a treat for me too because I don’t usually drink coffee. I do really enjoy it on occasion though. Bark Espresso serves Café Del Sol espresso from the Café Vita Roasting Company. Café Vita has roasted coffee right here in Seattle since 1995! They describe their Del Sol blend as rich and complex with hints of dark chocolate and praline and a caramel finish. I ruined that buy making it a Mocha. Once you add chocolate, that is all you taste. To be specific, I am having a tall, single Mocha with no whip. Not this morning. They do serve one of the best gluten free chocolate chip cookies ever. Skydottir Epic Cookies taste about as close as you can get to a normal cookie. They’re good but having a cookie (which I also don’t eat often) and a Mocha would be way too much sugar for me in one sitting. Any treat for your dogs on this occasion? I brought Zuke’s Mini Naturals to distract them from harassing other patrons and doggies if I have to. It’s one of their favorites. The treats are also a good way to get them to look at the camera for photos. How were you and Chester and Gretel united? I inherited Chester from an old roommate. She got Chester as a tiny puppy for Christmas one year. A couple of months later she had to go out of state for work. I had wanted a dog but wasn’t ready to fully commit to the responsibility. I thought it would be a great opportunity to try dog ownership out. I said I would take care of him for the month she was gone. One month turned into a couple of years of her mostly being gone. I really felt like I raised him. When I parted ways with my roommate, she moved to a place where she couldn’t take him. I offered to take him so he could stay in state and she could visit him when she wanted. He just never went back with her. My fiancé and I adopted Gretel last year from a local rescue. I had been thinking of getting a friend for Chester for a couple of years but not seriously. I would occasionally browse Petfinder to see what was out there. One day I came across Gretel’s photo. Her coloring was beautiful and I couldn’t resist her eyes. I couldn’t believe what I was seeing – that someone didn’t want this gorgeous dog! I immediately contacted the adoption agency. Then I got cold feet. Committing to a second dog was not something I took lightly. It was not normal practice, but the rescue thought we were the best fit for her so they held her for a week for us while we decided. We ended up taking her and couldn’t be happier. She is the love of our lives. How did your dogs get their names? Do they have any nicknames? It’s not a very exciting story. Both dogs were named by someone else and we just didn’t change them. Our next dogs will have hiking-related names like summit or something. 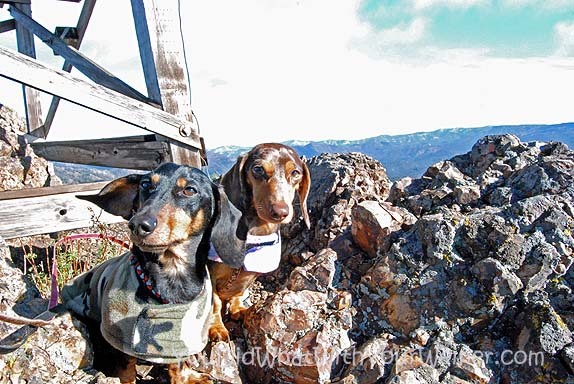 Chester and Gretel are adventure dogs. 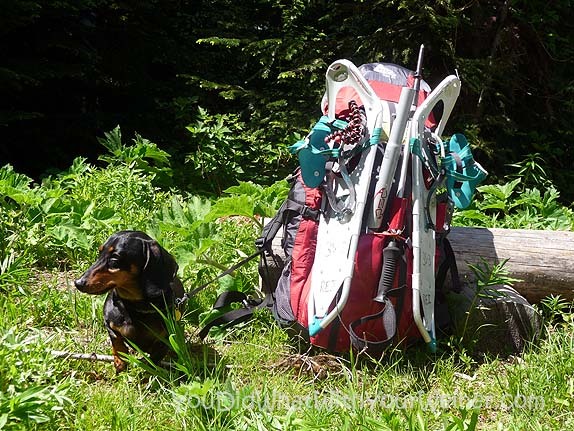 Can you give us an example of their outdoor prowess that people don't expect from small dogs? Well, they hike. And I mean steep hikes that make me sore the next day! They also snowshoe with us. There is not a hike or snowshoe we go on when we don’t get several questions like “Did you have to carry them up here?” or comments like “look at that poor dog with those little legs” (like we are being abusive or something). I have to assure every person that they love it and they can out hike us any day! I don’t know if it will happen, but one of our goals this summer is to hike to the top of Mount Adams with them. Mount Adams, at 12,276 feet, is the second highest peak in Washington State. We would take them up the first highest peak but dogs are not allowed on Mount Rainier. Squeakie toy...for about 5 seconds…because that is as long as they last before they chew them up and kill the squeakie. Where is Chester and Gretel's favorite place for an outing? In the Cascade Mountains. Well, really anywhere we hike in the woods but that is where we go most often. Who are Chester and Gretel's best pet-pals? Gretel has a BFF named Sienna. When we go out of town, Sienna and her Mom watch Chester and Gretel for us. Swift and Kool from the blog Life with Doxies, and our hiking buddy Marshall, are also some of our regular partners in crime. We have met a lot of other Dachshund through the Adventureweiner Club we started. As a matter of fact, two of them, Bambi and Yogi, showed up with their Mom and Dad while we were sitting in the café! There are over 150 dogs in our group and we consider all of them to be our friends. 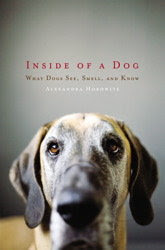 What is each dog's most endearing quality? Well, with Gretel it is her crooky face. She has so many silly expressions. One look at her and you just melt. With Chester it is his friendly, cool demeanor. He is my rock. I always know what to expect from him. He loves all people and people always comment that he is the calmest, friendliest Dachshund they have met. 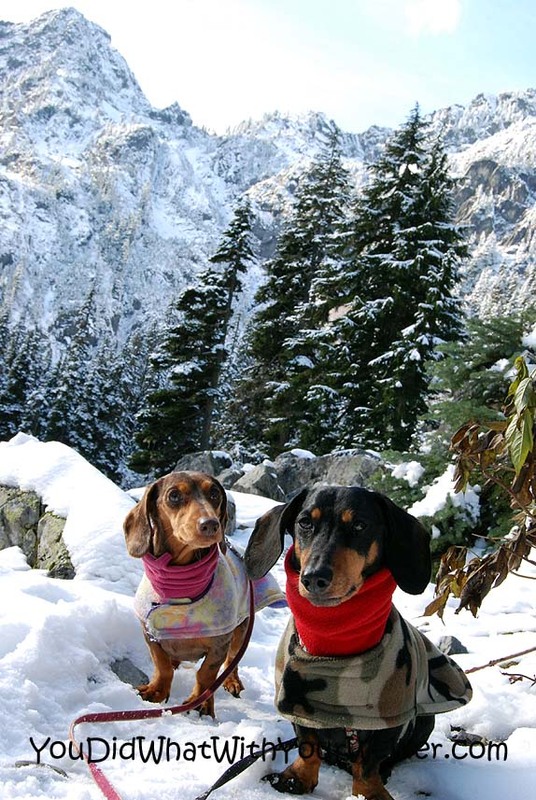 If Chester and Gretel could change only one thing about Seattleites, what would it be? Chester would want all of them to line up in one long line so he could do nothing but go from person to person for the rest of his life getting pets. Gretel honestly probably wishes they would stop having kids because she is not a fan. Ha, ha. What is each dog's proudest moment? Chester’s proudest moment is when he wins over a stranger (which really takes seconds and almost no effort on his part) and gets to hang out in their lap. He looks so content and smug. I am not sure Gretel has a “proud” moment. She is more of the sleeper type – she does amazing things all of the time but doesn’t even know it. If Chester and Gretel could speak in a movie about your life, what actors would you have doing the dogs' voices? Gretel would definitely be Sid from Ice Age. She kind of looks like him too. Chester would be some high society English speaking gentleman. 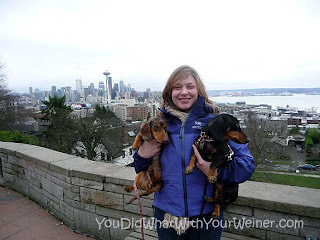 Visit the You Did What With Your Weiner blog. What great dogs! I love that last picture of them in the woods! Gorgeous photos of gorgeous dogs! 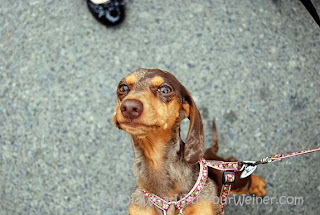 I'm a huge doxie fan, and have always dreamed of owning a little dapple. I've got a doxie rescue mix right now who is the love of my life. We live in the Alps, and he loves to come hiking with me. Anyone who thinks his legs are too short just has to come and see him go! Definitely gonna click on over to your website. Cheers! I'm a great big fan of Jessica, Chester, and Gretel, so I'm super excited about this wonderful interview! Oh we love you guys! So happy to see you here and learn a little more about you and the pups. Great interview. It is fun to learn more about Chester and Gretel. this was a very good one! thoroughly enjoyed it. i'm super jealous of your well-behaved dogs and your dog-friendly area.